Captain Atom's powers are spiraling out of control. He is being held in a facility that is managing to control these outbursts of his. He thinks back to how he got to this place, flash-backing to a few hours ago, as he attempted to save a cruise liner in trouble. His powers go haywire, and he tries to get back to the facility. Superman, Green Lantern and Cyborg show up, and lend a helping hand, but the energy spikes are too much for even them to handle. We end with them reaching Kansas, but Captain Atom has a burst of energy, and it manages to destroy parts of a Kansas town. 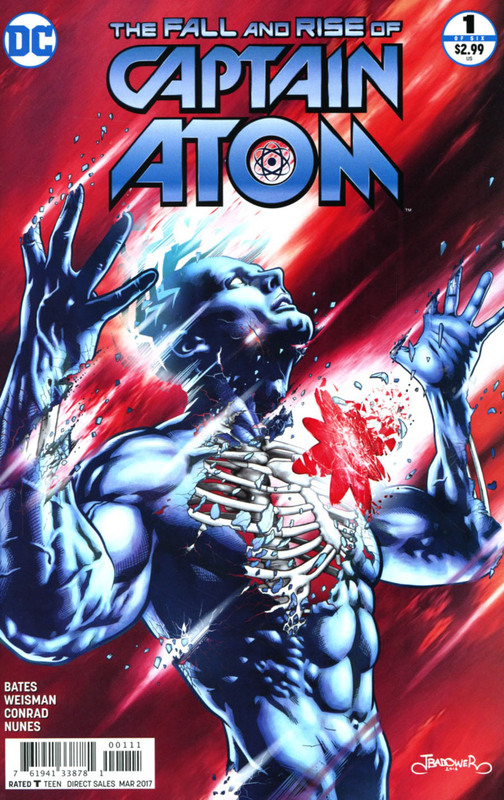 Back in the present time, Captain Atom has his final burst of energy as he disappears, and those scientists that are monitoring him come to the conclusion that he has finally died from his powers. On the last page we see Nathaniel Adam's lying naked in the rubble of the Kansas town unconscious, no longer Captain Atom. Story - 5: It's an interesting first chapter, in a six issue mini-series. This story obviously takes place pre Rebirth, as Superman is the New 52 version, still in his armor and not the t-shirt and jeans he would eventually sport. Not much else to say at this point, only future issues will tell if Superman will continue to make appearances in this book. Captain Atom was a good character, but I felt that the New 52 wasn't so kind to him. Hopefully if he does return, Rebirth will be a better platform. Art - 5: Will Conrad's art is always a joy to behold. He has done some nice work filling in on Cyborg. His eye for detail is evident in his backgrounds along with the details on the costumes of the heroes. His style reminds me of Bryan Hitch's work a lot. Now I loved the original metallic Chrome "skin" that Captain Atom had before the New 52 began. I wasn't sure why they changed him so drastically for the New 52 relaunch. I had always speculated that it was to make him look more similar to Dr Manhattan from Watchmen, seeing as how Dr Manhattan was the stand in for Captain Atom in storyline. For anyone that doesn't know, Alan Moore's original pitch for Watchmen was using the Charlton characters that DC acquired, but then changed them into new characters when he wasn't able to use them. I hope Captain Atom gets a new look, hopefully they go back to the Pre-New 52 look. Cover Art - 5: I like this cover a lot. I love that he is burning away leaving showing his skeleton underneath.